The very model of a modern dugout major general, Hinch is the first to earn a Series ring for Space City. 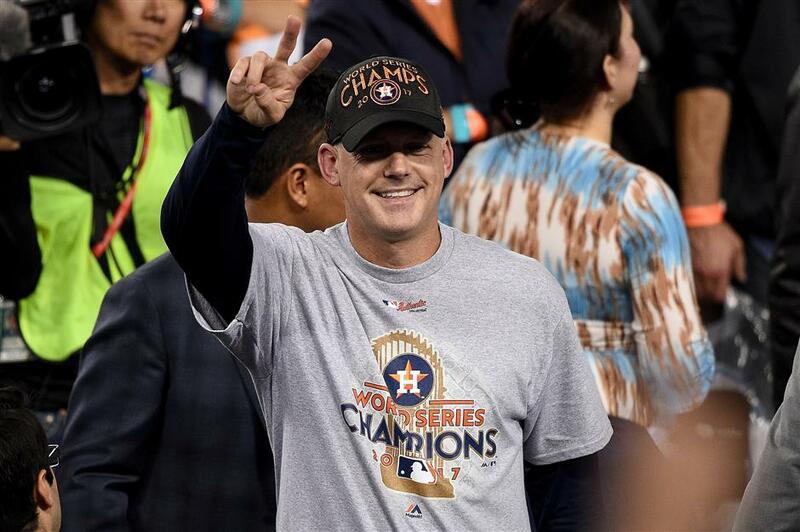 Manager AJ Hinch of the Houston Astros celebrates after his team defeated the Los Angeles Dodgers 5-1 in game 7 to win the 2017 World Series at Dodger Stadium in Los Angeles on November 1, 2017. About a dozen years ago, AJ Hinch figured out his future in baseball wasn't behind the plate. "When you don't hit a slider consistently, you're not going to play very long," he recalled on Wednesday. "And there's only so far personality can take you as a backup catcher." Charisma, however, is nearly everything in an era when many dugout decisions are delegated to front-office administrators analyzing stacks of statistics. The Astros manager motivated his players, soothed them and charmed them to a runaway title in the American League West and then to the first World Series championship in Houston's 56-season history, capped by a 5-1 win over the Los Angeles Dodgers in Game 7 on Wednesday night. "I will run through a wall for that guy any day," Series MVP George Springer said. Hinch is Houston's 18th manager in a line that began with Harry Craft, included personalities such as Harry Walker and Leo Durocher, Manager of the Year winners Hal Lanier and Larry Dierker, and Phil Garner, who led the Astros to their first pennant in 2005. The very model of a modern dugout major general, Hinch is the first to earn a Series ring for Space City. "My job is to push them when they need to be pushed, to hug them when they need to be hugged, to believe in them always, and set a culture where they'll believe in themselves and they'll prioritize winning," Hinch said, his T-shirt soaked and the stench of bubbly surrounding him. "The players are really what makes the sport go. And the more you can get out of them, the more you can get them to trust in you, believe in you as a leader, the better you'll be as a manager," he explained. "I'm not sure you know that right out of the chute when you first get one of these jobs. At least for me as a young guy, I didn't appreciate what it took to put your heart and soul into the players and let them see you for who you are, and in return ask them to be themselves." Now 43, Hinch took an unusual path to the big leagues. Drafted as a high school senior by the Chicago White Sox in the second round in 1992, he elected to attend Stanford. Selected three years later by the Minnesota Twins in the third round, the psychology major decided to stay in school and get his bachelor's degree. He finally signed when picked by the Oakland Athletics in the third round in 1996. After earning a bronze medal with the 1996 US Olympic team, Hinch made it to the major leagues two years later and played six seasons that included time with Kansas City (2001-02), Detroit (2003) and Philadelphia (2004). He hit .213 with 32 homers and 112 RBIs — not in a season but in his big league career — and stopped playing at age 31 after spending 2005 with the Phillies' Triple-A team at Scranton/Wilkes-Barre. He was hired that November as manager of minor league operations for the Arizona Diamondbacks. Promoted to director of player development, Hinch was a week shy of his 35th birthday when he replaced Bob Melvin in Arizona and became the majors' youngest manager. "He brings unique leadership and perspective to the job," then-general manager Josh Byrnes said. "We're not here to reinvent the wheel, but to change the nature of the job a little bit." Hinch wasn't sure his psychology degree would be an asset in the dugout. "I think it's more about having a rough major league career might help me more relate to these guys that go through the mental anguish of the failure of our game," he said. "My job is to get the most out of guys, and a lot of times my job is sort of the emotional psychological support that it takes to get the most out of these guys." Fired along with Byrnes just before the All-Star break in 2010, Hinch spent four years as San Diego's vice president of professional scouting. He was 40 when the Astros hired him. "So I feel old and experienced," he said. He took over a team that went 70-92 and led it to a wildcard berth and its first playoff appearance in a decade in 2015. He melded the young stars with veterans seemingly seamlessly, a combination that led Houston to 101 wins this season, one shy of the team record, a major league-high 21-game division lead and a pair of Game 7 wins in the postseason. "It's really fun to play behind a guy like this," second baseman Jose Altuve said. "OK, he trusts me, but if I do something that is wrong or something, he's going to get out there and let me know. But he let us know what we have to do in the best way he could do it. Never lies. He never disrespects his players." After Springer went 0 for 4 with four strikeouts in the opener, Hinch sent his leadoff hitter a text. "Just said to kind of enjoy this, because this is the best time of our baseball life," Springer said. "And he stuck with me. He stuck by me." Springer sparked the Astros with a leadoff double in Game 7 and went on to tie the World Series record of five home runs and set the mark for extra-base hits with eight while batting .379 with seven RBIs. "For him to have my back, it means the world to me. And I'll always have his back," Springer said. "And that just shows who he is."